Flat, wide and with a long wheelbase – those are the proportions of a classic Gran Turismo. And the Audi e‑tron GT concept reflects these with its 4.96-metre (16.3 ft) length, 1.96-metre(6.4 ft) width and 1.38‑metre (4.5 ft) height. The lightweight body of the four-door coupé is manufactured using a multi-material construction. Here you have a roof section made from carbon along with numerous aluminium components and supporting elements made from high-strength steel. This is however clearly taken forward into the future, pointing the way to the next evolutionary stage of the Audi design language. The cabin that tapers strongly toward the rear stands out compared with current Audi models. Wheel arches and shoulders are sculpted emphatically and, together with the flat floor that is unusual for an electric vehicle, visually underlines the low centre of gravity and the dynamic potential of the Audi e-tron GT concept. The sill area between the wheel arches has been drawn way outwards, creating a distinctive contrast with the cabin. The sill draws the eye to the underfloor area where the battery and thus the energy centre of the Audi e-tron GT concept are located. The design of the wheels with their five twin spokes is also visibly aligned to their function. Their dynamic design provides optimum ventilation of the brake discs while also reducing drag. Shod with 285/30 size tyres, the 22-inch wheels also make a clear statement when seen from the side. The hallmark Audi Singleframe is located in the centre of the front section. Compared with the two e-tron SUVs its architecture is much more horizontal. The top half comes with a cover painted in body colour. 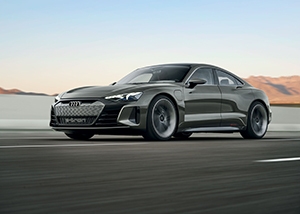 Its surface structure is reminiscent of the typical honeycomb pattern of the grille on the Audi RS models – a visual signal which characterises the Audi e-tron GT concept as a future product of Audi Sport GmbH. The arrow-shaped front section also emphasises the matrix LED headlights with laser high beam, underscoring the dynamic presence of the Audi e-tron GT concept even while stationary. As already seen with the brand’s current Visions vehicles, the light is also animated here and welcomes the driver with a short function sequence, the wave of light that extends horizontally: a new visual signature that is set to find its way into series production in future. The new exterior colour kinetic dust is a warm, dark colour akin to titanium. Depending on the incidence and movement of the light, it provides significant contrast between the body surfaces. Matt, warm-tinted aluminium elements on the window slot trim and rims emphasise these effects even further. support even while cornering at speed. Both the screen of the central instrument and the touchscreen above the centre console come with a black-panel look finish. They underscore the large, calm design of the interior with its predominantly horizontal basic architecture. Various layouts are available for the monitors to present the functions depending on the driver’s preference, including virtual instrument dials, easy-to-read navigation maps with information on the range, or various infotainment function menus. They are controlled via the touchscreen with tactile feedback. With the concept car the designers have deliberately gone for the consistent use of sustainable materials – a clear statement of contemporary automotive design. Animal-based products are not used at all: the Audi e‑tron GT concept comes with a vegan interior. Sophisticated, synthetic leather is used on the seats and other trim surfaces. Fabrics made from recycled fibres are used on the seat cushions as well as the armrests and on the centre console. With two luggage compartments, the Audi e-tron GT concept offers a great many options for a Gran Turismo. Here it makes full use of its concept advantage as an electric automobile with compact drive units. The rear with its large tailgate offers up to 450 litres (15.9 cu ft) of luggage capacity. Under the bonnet there is an extra 100 litres (3.5 cu ft) of capacity. 434 kilowatts (590 hp) of system power – that is an impressive figure for the potential of the all-electric drive. Separate electric motors are fitted to the front and rear axles. In both cases these are permanently excited synchronous motors. They put down the torque onto the road via all four driven wheels – naturally the new Audi e-tron GT concept is also a genuine quattro. An electric quattro to be precise, since there is no mechanical link between the front and rear axle. The electronic control system coordinates the drive between the axles as well as between left and right wheels. That means optimum traction and just the desired amount of slip. In future, the vehicle should accelerate from 0 to 62mph in around 3.5 seconds before going on to 124mph in just over 12 seconds. The top speed is regulated at 149mph to maximise the range. One feature that not all the competition can match is the option of fully utilising the drive’s acceleration potential several times in succession. While elsewhere the drive is switched to overdrive for thermal considerations, the Audi e-tron GT concept can provide the driver with the full potential of both motors and the battery thanks to its sophisticated cooling strategy. The range of the concept car will be over 248 miles, determined according to the new WLTP standard. The required drive energy comes from a lithium-ion battery with an energy content of more than 90 kWh, which takes up the entire underfloor area between the front and rear axle with its flat design. The decisive advantage of this design is the car’s extremely low centre of gravity – comparable with that of the Audi R8 – which in turn decisively benefits dynamic handling. All-wheel steering translates this into a perfect synthesis of sports car-like agility and precision, augmented by superb directional stability. The recuperation system increases the range by up to 30 percent on Audi electric vehicles – this is essential even with a sports car such as the Audi e-tron GT concept. The recuperation involves both the two electric motors and the electrohydraulically integrated brake control system. involved only when the driver decelerates by more than 0.3 g using the brake pedal. The Audi e-tron GT concept features high-performance ceramic discs which also operate with multiple extreme decelerations without compromising braking performance. Wired charging is much faster as the four-door coupé is fitted with an 800-volt system. This substantially reduces charging times compared with conventional systems that are currently in use. Thus it takes around 20 minutes to recharge the battery to 80 percent of its capacity, once again providing a range of more than 198 miles (WLTP). The e-tron GT concept can, however, also be recharged at charging points with lower voltages, providing the driver with access to the entire charging network.